You are standing before a cleft in the mountain: the new home of your dwarf tribe. There is a lot of work to be done with only two pairs of helping hands at the start. Soon more members of your tribe will be able to help but there is no time to be wasted. Another nearby tribe is seemingly doing better than you. So, chop, chop! 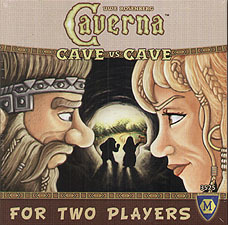 Cut into the mountain; furnish cavern after cavern; collect grains, flax and building resources. Look out for precious metals and get wealthier than the other tribe could ever have imagined! Components: 1 Action board, 12 Action tiles, 2 Cave boards, 24 Room tiles, 12 Goods indicators, 1 Additional Cavern tile, 7 Walls, 4 Action markers, 1 Starting Player tile, and 1 rule book.